It sometimes happens that a name is mentioned on Sandy Brown Jazz that results in readers remembering that particular person. This is particularly so for George Baron, seemingly know to everyone as 'Banjo George'. We share those memories here, but would like to expand on this record of a popular jazz banjo player. Where and when was he born? What is his story? What memories can you add? If you can help, please contact us and help us build up the picture. George was born in Coventry in 1906, and his full name was George James Thornhill Robbins. He took to the name 'Baron' as his stage name from his mother, Leah Baron. He married my mother, Phyllis Josephs some time in 1936, and I was born in 1937. They subsequently divorced. He told me that my grandmother celebrated her eightieth birthday playing banjo in a pub in North Road Brighton. He also told me that he made most of his money playing poker. George Baron played banjo in a group known as Andy's Southern Serenaders (directed by Harry Leader) which made some records for Parlophone in 1935. Apart from being fondly remembered, there does not seem to be much information around about George - does anyone else remember him? I sat in with him and Eggy Ley at Tattie Bogle Club in 60s - see the photo above. Banjo George had a connection with early dance bands, and singer, Lois Lane. 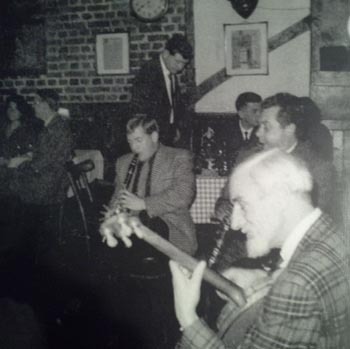 The photo of George at the Tatty Bogle brings back many happy memories for me, (incidentally it is Eggy Ley just on his shoulder with the clarinet or his usual soprano sax), the other gent I do not recognise. I was introduced to the "Tatty" by the late Les Muscutt. We used to go there with our guitars late on a friday or sat night. Anyone could sit in as long as it was acoustic. One of the regulars who taught me a lot about rhythm guitar was Neville Skrimshire. Another was the mystical character Alan Leat, a generous sort of gent who hired some top level players to 'jam' at a pub in Chelsea on a thursday night, I remember playing there with Lennie Felix and Dave Shepherd at times. Other sitters in that I remember included an Italian gent who taught guitar at Guildhall (?) and my favourite 'trad' guitarist/banjo Tony Pitt. On a good night even the sitters in received a token payment! One must mention "The Moose", with the hook in his nose and the ring on a string that you had to attempt to catch on the hook. I believe the Tatty is still there and you still have to go in the top of Kingly Court and find the door under the fire escape. George was an unforgettable character, very generous, full of enthusiasm and knowledge. He emigrated to Sydney, Australia and in 1976 when I had the good fortune to make a record with Graeme Bell who was visiting Toronto, I asked if he knew of George, (now well into his 80's) and he told me he was playing in a Sydney pub and that they fetched and delivered him by taxi. Those were the days. I have many fond memories of George, learning and understanding chord sequences playing with him at "The Tatty Bogle" along with Eggy Ley, Neville Skrimshire and Les Muscutt. Just after I qualified I was a Houseman at St George's Hyde Park Corner and George called on a Saturday morning asking if I was free? As it happened, I was. He asked me to meet him at a tube station in the West End with my guitar. I did so and he said we were going to a house nearby, the occupants of which were at the church, where their daughter was getting married. We arrived before they returned, but George spoke to the man in charge of catering to guarantee a supply of beer and smoked salmon and we sat in a room until returning 'party noises were heard. George then said: "Start playing some melody" and to my surprise the parents of one of the parties came in greeting George like a long lost friend and requesting various tunes from the '30s - '40s which we played. Out came the fivers and we left several hours later considerably 'better off'. I think my share was the equivalent of 2 months NHS House Officer stipend (we got 1 pound a day then!). Apparently George used to serenade the parents before WW2, and they obviously remembered him. Many times we used to gatecrash parties with George after a night at the Tatty and were always welcomed by people who knew George. Happy days, now long gone, as someone said our kind of music has an audience of senior citizens and their parents. Maureen Connolly sent us this picture of 'Banjo George' Baron. 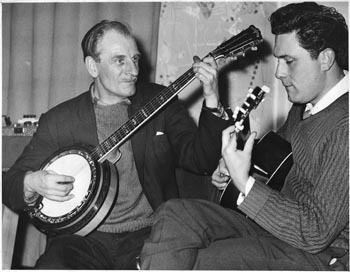 The picture was taken in around 1957/58, with George playing Maureen's husband's (David Snell) Clifford Essex banjo. During my early days in London I would see George dropping in with banjo at various Soho hangouts. One particular favourite performance space - for George every appearance was a potential performance - was The Gyre and Gimble Coffee House, a basement in Adams Street. This was a well known place for musicians various to meet, perform, and jam in a range of styles. Folk guitarist Davey Graham, Long John Baldry, Rod Stewart, Tommy Steele, Wiz Jones, and many more. George had a well developed sense of his own importance and expected and received rapt attention. He would commence with a tune or two and then having set an atmosphere, would perform his rendition of the rhapsodic movement of George Gershwin's - Rhapsody in Blue. One might tend to disbelieve - the instrument being a banjo - but he produced a sensitive - even plaintive - rendering of this well known melody. Having had his moment and due acclimation he would pack up the banjo and depart off into the night. I did, in fact, try to see on Google if there was any mention of - presumably long since departed - Banjo George. Nothing so far as I could see - George Formby Banjo - displaying endless pages of links and information. Sometimes I do wonder if the sense - London in the Sixties - of living in a village community has its contemporary equivalent. Here's an interesting snippet about Banjo George: he went off to Russia "just to have a look at it" (his words) and came back with a pretty little folk tune. Kenny Ball heard it, George said he could have it if he liked, and Kenny turned it into a No. 1 hit with Midnight In Moscow! Just read the short story of Banjo George about Midnight in Moscow. I strongly doubt if it is true. Kenny Ball recorded the tune in September 1961 but there was already a Trad version on the market (Storyville A45042), played by the Dutch New Orleans Syncopators and recorded on January 4, 1961. I've always thought that Kenny heard it and saw the hit potential. I had the origins of Kenny Ball's hit told to me by Banjo George himself and there is no reason to doubt him. [We investigated this story further in a Jazz Remembered feature - click here].